In celebration of the release of Journal #3 and the closing of the Gravity Falls series, creator Alex Hirsch along with other production staff and professional illustrators will be contribuing new and original artwork to this official Gravity Falls exhibition / book signing. Alex Hirsch will be in attendance on opening night only! The ART exhibition will be up from 8/6/16 - 8/21/16 during our normal business hours. Cosplay is highly encouraged! Open to the Public, All Ages Welcome, No RSVP needed. This is expected to be a HIGHLY attended event, so please plan accordingly! Exclusive door prizes and raffle giveaways will be available to attendees only. First 100 people in line will be able to get in early and get their book signed by Alex. NO SAVING SPACES FOR FRIENDS/FAMILY, NO EXCEPTIONS! IF you are not physically there at the time we start counting, you will NOT be included as part of the first 100. 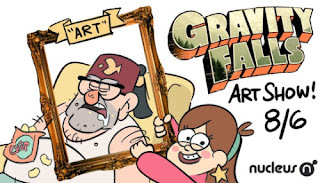 In order to receive a bracelet for the signing, the first 100 people must EITHER purchase their Gravity Falls merchandise in our store OR if you bring an outside book for signing, it will be subject to a $10 fee. Media/VIP Preview Hour from 5p-6p. Doors open to the public at 6pm.